There’s a local bakery and sandwich shop here in my town that is absolutely amazing. I took my daughter there one afternoon for lunch, and we got some sandwiches and cookies for dessert. It was a cute little shop, and the owner seemed to know almost everyone that came in to get something to eat. After introducing myself to the owner and talking with him, I told him about being culinary school and how I also did a lot of baking at home. That’s when the conversation really started. He cut us two samples of his famous caramel cake, and after taking one bite…I was in heaven. It was absolutely amazing, and I called my husband afterwards, telling him that for my birthday this year, I wanted a caramel cake from this place. Although he didn’t have the recipe available for this cake, he did have a recipe published in the local newspaper for his banana cake. I took a picture of the recipe and got started a few weeks later at home. There are a few minor modifications to the recipe, but overall it’s pretty much the same. For the icing though, he does use banana extract instead of vanilla, but I decided to go with vanilla for this cake. And since I’m a little picky on texture, I pureed the bananas with the wet ingredients before putting it all together. 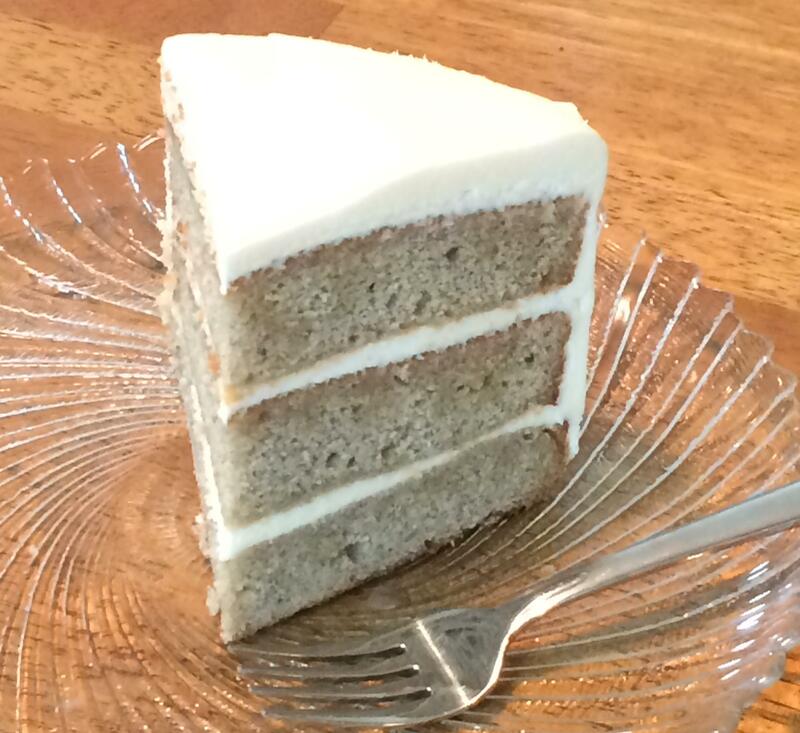 Such a wonderful banana flavor, especially paired with this delicious cream cheese icing! Preheat oven to 350 degrees. Grease and flour three 8 inch cake pans. In a large bowl, combine flour, sugars, baking powder, baking soda, salt, and cinnamon, mix well. Add mashed bananas, eggs, buttermilk, butter, and vanilla. Beat with electric mixer at medium speed for 2 minutes or until smooth. Pour into pans and bake for approximately 25 minutes. Cool in pans for about 10 minutes, then remove cakes from pans and finish cooling on cooling racks. Layer with icing. Cream butter and cream cheese together in bowl using an electric mixer for 2-3 minutes. Add vanilla extract and powdered sugar, then continue beating for another 3-4 minutes until smooth and creamy.